The first snow came this past Friday morning— a white, powdery quilt cover —tucking away and hiding the slimy, wet leaves matted down, scattered over the driveway and hills. For the first time in weeks, I perceived order; there was quiet. I am grateful for the calm of this brief snow. The winds of change swirl all around. Senator McCain conducted a three-hour hearing on Russian hacking yesterday. The radio and Internet are abuzz with anticipation over how the president elect will respond to the in depth release of the CIA’s long investigation. When I switch to AM/FM or to CNN or MSNBC, I am anxious, anticipating disquiet. From my kitchen window, I am grateful for the sight of a rough hewed oak trunk mottled with snow clumps. 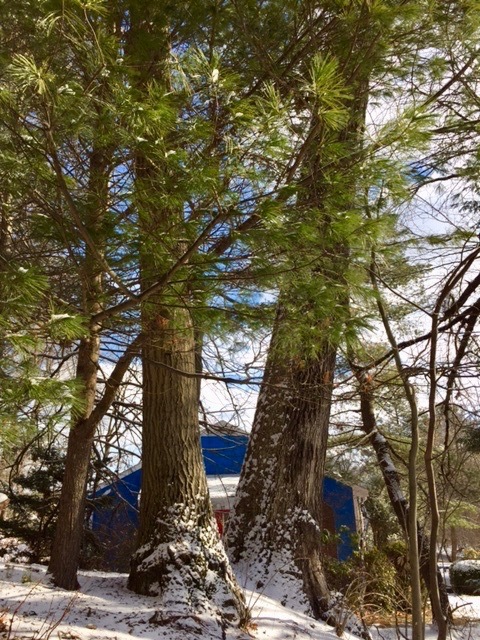 The tree is sturdy and steady, sheltered, in part, by a lean companion pine with its green feathery needles stretched outward. The sight brought to mind observations of Peter Wohlleben, the author of The Hidden Life of Trees: What They Feel, How They Communicate. These trees are friends. You see how the thick branches point away from each other? That’s so they don’t block their buddy’s light. I decide to look closer, grab my IPhone and sweater, step out onto the snowy steps and patio. Close up, there are two grand oak trunks leaning towards one another in a “V” shape, root-linked. Trees like to stand close together and cuddle. There is in fact friendship among trees. I am grateful for the presence of these two companions just as I am grateful for the friendship of my women’s group. We met yesterday, five of us huddled under hand-knit shawls, to fend off the chill on our necks, our backs as we shared news of family, and worry for our country’s future in anticipation of Trump’s inauguration. Last night, Marv and I shared Shabbos dinner with two couple friends. The ritual is familiar— we light the Shabbos candles, say a prayer over wine and challah. We talked—first of pleasantries, the winter, plans for travel, one couple, “snow birds” for six weeks, my envy hidden. Mid-meal, we land on Trump, the GOP, their mission to repeal, the topic of dissent— how to make it positive, avoid backlash. What I know, deep down, is that we must stay alert, just as when one tree is attacked by insects…electrical signals pass through the bark and into the roots and from there into fungi networks in the soil that alert nearby trees of danger. As darkness comes, I lose sight of the trees, turn to the television for news, the worry of new Trump Tweets, its effect on programs I believe in. Would that I could remember, call to mind at will, the soft comfort of calm my morning companion trees invoke. Calm, like gratitude, must be invoked with the deliberate intention to dial down and focus on the in and out breath, the deepening sigh at the sight of snow. This entry was posted in Creativity, Currents, Mindfulness, Nature, Politics, Well-Being, Writing and tagged breath, dissent, friendship, networking, trees on January 9, 2017 by fayewriter. Beautiful and lyrical post. Thanks for putting your words in the world, Faye! Thank you, Heather, for your high praise. Bev, I am so touched by your response, especially the part about growing beside one another and making sure we have protected each other’s light… so apt and resonant. May we continue to support each other’s thirst for learning and creativity. Looking forward to your next collage! Faye, I found this piece beautiful and full of insight. Thank you. Robin, I so appreciate your comment. Our last writer’s discussion was helpful!! This piece calls to mind the quiet of writing itself: not what’s “shouted out” in Tweets, but what’s silently woven into a set of connected thoughts on paper or in a blog. I like how the idea of disquiet is brought in too, as the writer describes the huge effort–an act of will really–needed to turn down the volume on this daily, disturbing political din. Rosemary, would that we could automatically will quiet. Perhaps, with more practice, the reset will ease in. Hoping that you are enjoying a time of quiet and ease in your poetry focus.